A Direct Care Staff is a personal care assistant who takes responsibility for providing assistance and support to people who are sick, mentally or physically disables, elderly, fragile or injured. 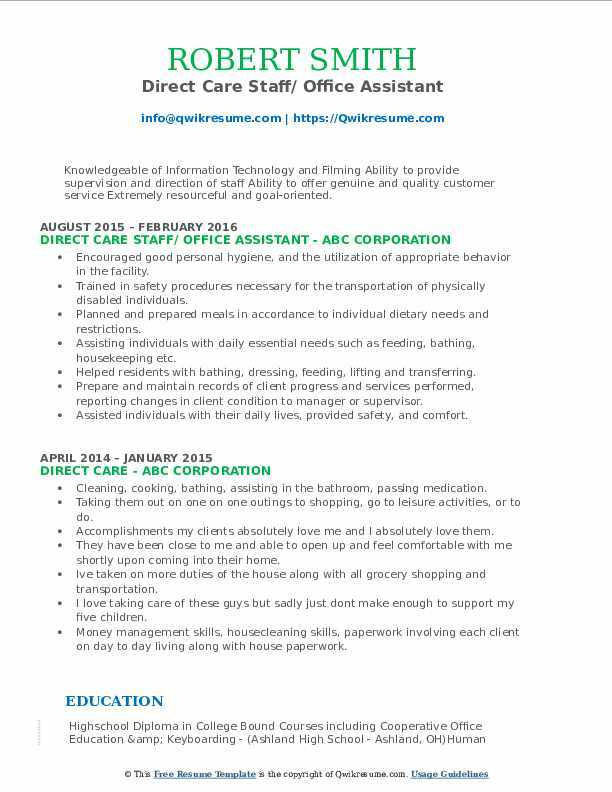 The most common duties listed on the Direct Care Staff Resume include the following – working in the home and helping patients with their daily core tasks like bathing, and bathroom tasks; feeding and grooming patients, administering medications, and running household errands. 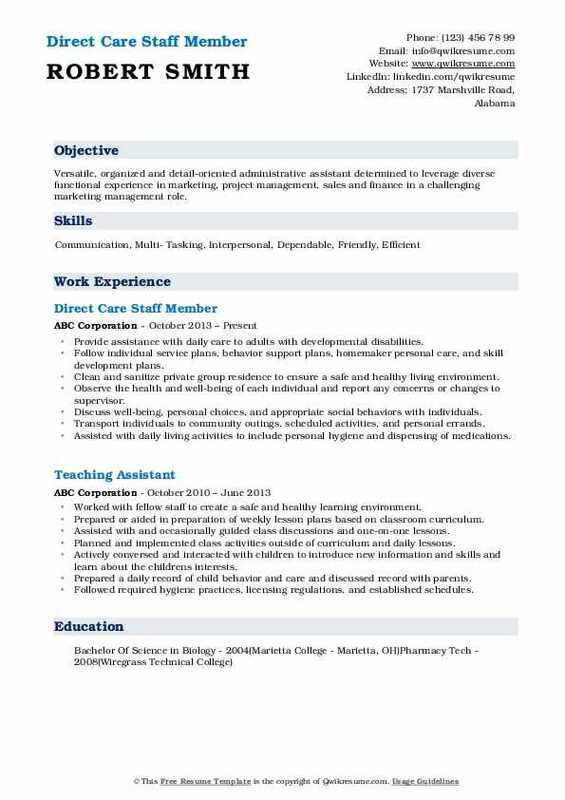 Part of job description also includes accompanying clients to medical appointments and helping in therapy sessions. 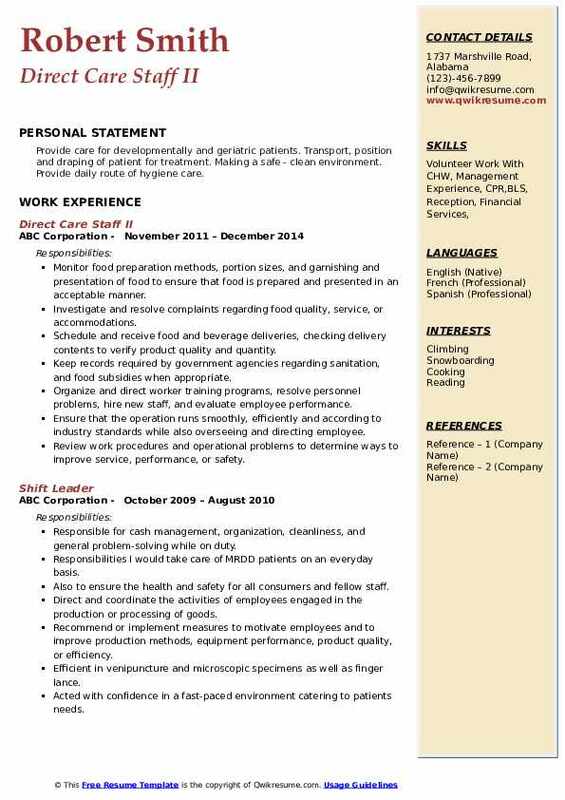 The qualities and skills expected on job resumes include – detailed knowledge of patient’s condition and medications; physical stamina, awareness of proper first aid and ERP; friendly and open demeanor; strong listening skills, and close attention to details. Those applying for this post should have an associate’s degree in Nursing or the relevant. Objective : Seeking a challenging and rewarding position with advancement opportunities within an operationally exceptional environment, allowing me to make a difference within an organization that is making a positive impact in our community. Assisted, monitored, and taught individuals with a preparation of daytime activities. Maintain positive relationships with clients, staff as well as have a good rapport with therapists, student interns, families, and volunteers. Direct care maintained high standards in sanitation and safety and complied with regulatory guidelines. 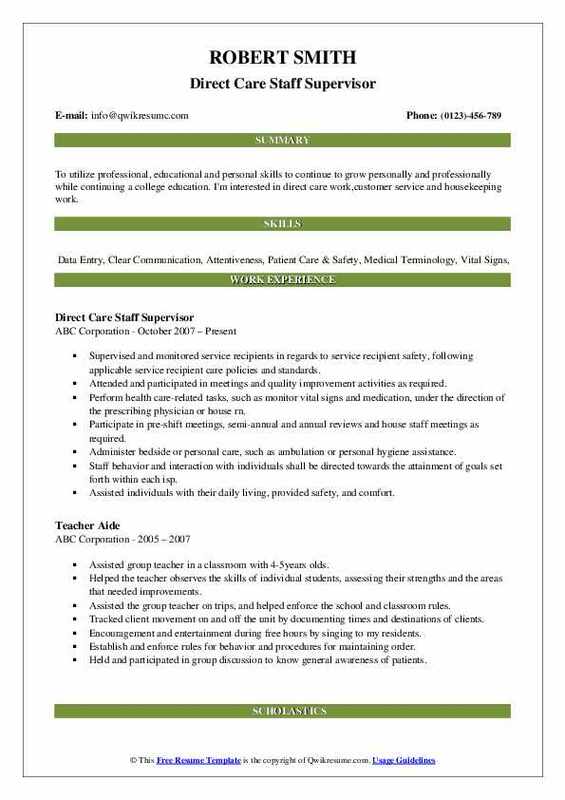 Assisted direct care supervisor in the assessment of each individuals abilities, interests and need areas toward independent living. Transported individuals with special needs competently using handicapped equipped vehicles. Completed documentation and assessments on clients to satisfy state requirements. Completed mandatory documentation within the time line established by applicable regulations. Objective : A highly efficient and dynamic professional who displays perseverance and is motivated by new challenges. 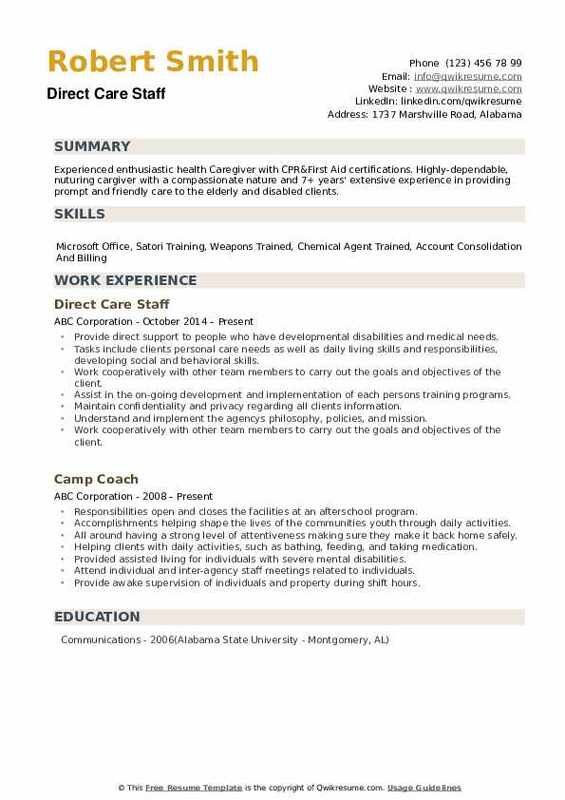 4 Years of experience in multiple industries ranging from Culinary Arts, Mental Health services and Office Assisting. Combined with the ability to respond to individuals that are diverse in gender, age, ethnicity and abilities. Provided supervision with the development and implementation of each individual's support plan. Provided support with implementing program plans designed to enhance the individual's social, emotional, cognitive, physical, and independent living skills. Assisted individuals with behavioral, social, money management, housekeeping, hygiene, and other skills necessary to reach their highest level of potential. Completed and updated all daily, weekly and monthly records, reports, logs, casework notes, administrative paperwork, fiscal reports, and medical records in an accurate, timely, and professional manner. Collaborated and cooperated with agencies, family members, and other service providers. The ensured worksite is safe, comfortable, well maintained, and free from hazards. Provided support to individuals in arranging for medical care. Conducted quarterly fire drills. Performed periodic evaluation of individual progress to update action plans as needed. Summary : To utilize professional, educational and personal skills to continue to grow personally and professionally while continuing a college education. 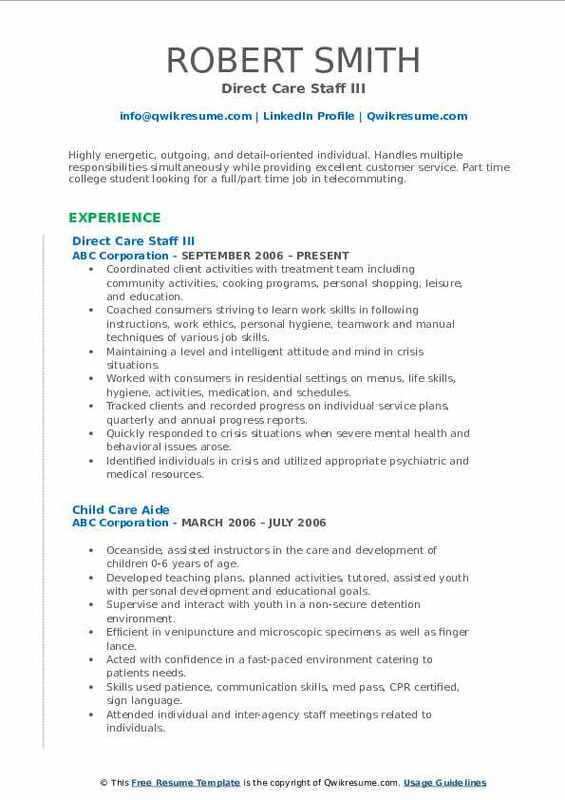 I'm interested in direct care work,customer service and housekeeping work. Supervised and monitored service recipients in regards to service recipient safety, following applicable service recipient care policies and standards. Attended and participated in meetings and quality improvement activities as required. Perform health care-related tasks, such as monitor vital signs and medication, under the direction of the prescribing physician or house rn. Participate in pre-shift meetings, semi-annual and annual reviews and house staff meetings as required. Staff behavior and interaction with individuals shall be directed towards the attainment of goals set forth within each isp. Assisted individuals with their daily living, provided safety, and comfort. Summary : Highly energetic, outgoing, and detail-oriented individual. Handles multiple responsibilities simultaneously while providing excellent customer service. 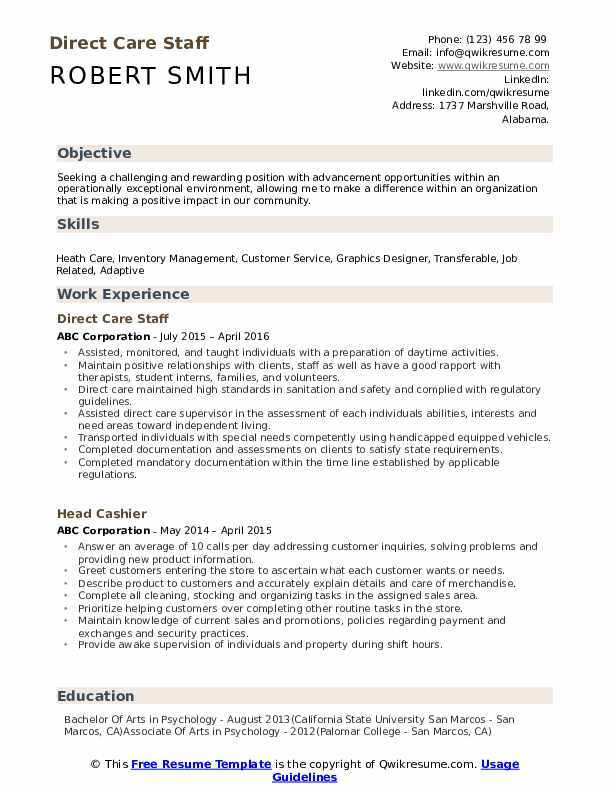 Part time college student looking for a full/part time job in telecommuting. Coordinated client activities with treatment team including community activities, cooking programs, personal shopping, leisure, and education. Coached consumers striving to learn work skills in following instructions, work ethics, personal hygiene, teamwork and manual techniques of various job skills. Maintaining a level and intelligent attitude and mind in crisis situations. Worked with consumers in residential settings on menus, life skills, hygiene, activities, medication, and schedules. Tracked clients and recorded progress on individual service plans, quarterly and annual progress reports. Identified individuals in crisis and utilized appropriate psychiatric and medical resources. Summary : To learn new things, while learning, provide the best customer experience possible.My objective is to provide my skills and provide leadership and communication a team of coworkers. Use my experience in Food Service in Military Dinning Halls. Also working with people who have disabilities. 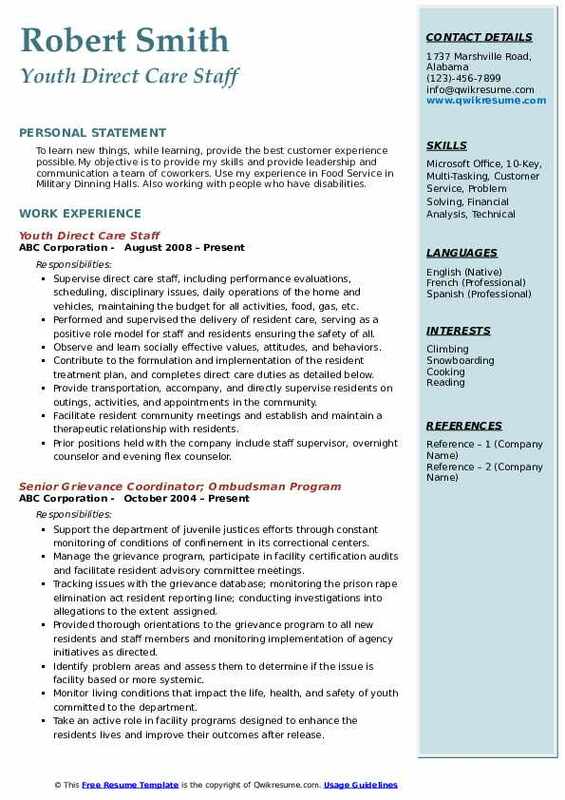 Supervise direct care staff, including performance evaluations, scheduling, disciplinary issues, daily operations of the home and vehicles, maintaining the budget for all activities, food, gas, etc. Performed and supervised the delivery of resident care, serving as a positive role model for staff and residents ensuring the safety of all. Observe and learn socially effective values, attitudes, and behaviors. Contribute to the formulation and implementation of the resident treatment plan, and completes direct care duties as detailed below. Provide transportation, accompany, and directly supervise residents on outings, activities, and appointments in the community. Facilitate resident community meetings and establish and maintain a therapeutic relationship with residents. Prior positions held with the company include staff supervisor, overnight counselor and evening flex counselor. Summary : Versatile, organized and detail-oriented administrative assistant determined to leverage diverse functional experience in marketing, project management, sales and finance in a challenging marketing management role. Provide assistance with daily care to adults with developmental disabilities. 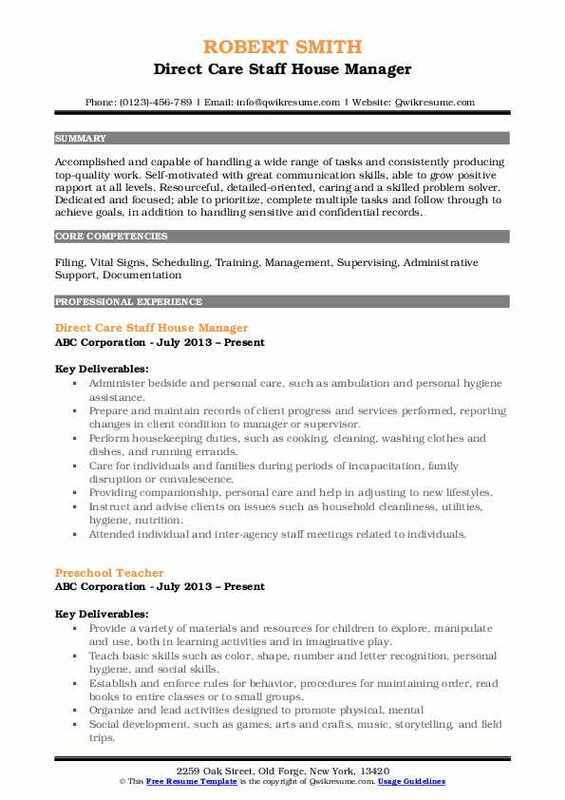 Follow individual service plans, behavior support plans, homemaker personal care, and skill development plans. Clean and sanitize private group residence to ensure a safe and healthy living environment. Observe the health and well-being of each individual and report any concerns or changes to supervisor. Discuss well-being, personal choices, and appropriate social behaviors with individuals. Transport individuals to community outings, scheduled activities, and personal errands. Assisted with daily living activities to include personal hygiene and dispensing of medications. 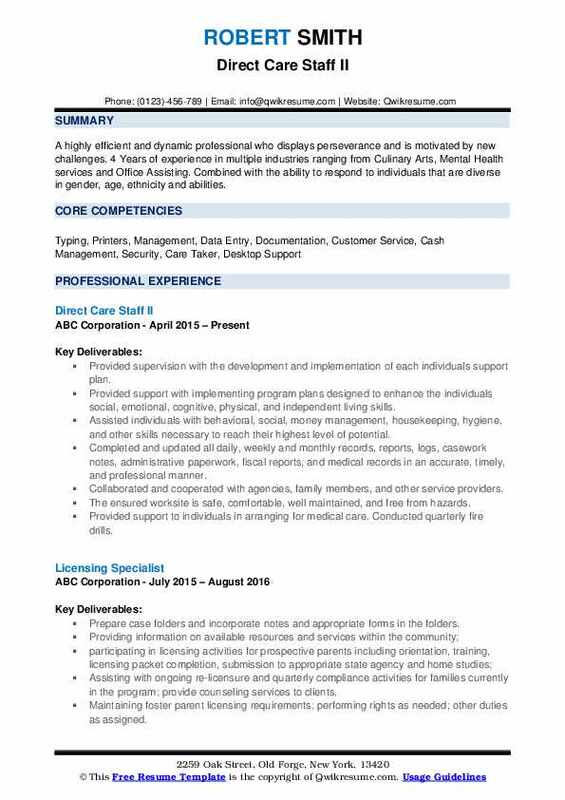 Objective : Knowledgeable of Information Technology and Filming Ability to provide supervision and direction of staff Ability to offer genuine and quality customer service Extremely resourceful and goal-oriented. Encouraged good personal hygiene, and the utilization of appropriate behavior in the facility. Trained in safety procedures necessary for the transportation of physically disabled individuals. Planned and prepared meals in accordance to individual dietary needs and restrictions. Assisting individuals with daily essential needs such as feeding, bathing, housekeeping etc. Assisted individuals with their daily lives, provided safety, and comfort. Headline : Accomplished and capable of handling a wide range of tasks and consistently producing top-quality work. Self-motivated with great communication skills, able to grow positive rapport at all levels. Resourceful, detailed-oriented, caring and a skilled problem solver. Dedicated and focused; able to prioritize, complete multiple tasks and follow through to achieve goals, in addition to handling sensitive and confidential records. Administer bedside and personal care, such as ambulation and personal hygiene assistance. Perform housekeeping duties, such as cooking, cleaning, washing clothes and dishes, and running errands. Care for individuals and families during periods of incapacitation, family disruption or convalescence. Providing companionship, personal care and help in adjusting to new lifestyles. Instruct and advise clients on issues such as household cleanliness, utilities, hygiene, nutrition. Attended individual and inter-agency staff meetings related to individuals. Objective : Provide care for developmentally and geriatric patients. Transport, position and draping of patient for treatment. Making a safe - clean environment. Provide daily route of hygiene care. Ensure that the operation runs smoothly, efficiently and according to industry standards while also overseeing and directing employee. Summary : Experienced enthusiastic health Caregiver with CPR&First Aid certifications. Highly-dependable, nuturing cargiver with a compassionate nature and 7+ years' extensive experience in providing prompt and friendly care to the elderly and disabled clients. Provide direct support to people who have developmental disabilities and medical needs. Tasks include clients personal care needs as well as daily living skills and responsibilities, developing social and behavioral skills. Work cooperatively with other team members to carry out the goals and objectives of the client. Assist in the on-going development and implementation of each person's training programs. Maintain confidentiality and privacy regarding all client's information. Understand and implement the agency's philosophy, policies, and mission. Develop and foster a professional relationship with the client based on mutual respect and trust.